英文摘要：According to China Classification Society Rules for Intelligent Ships, in this paper we first analyzed the current application characters of Wireless Sensor Network (WSN) for intelligent ship. Then we established six types of static network model based on the theory of electromagnetic wave transmission, which are no-box model, closed-box model, open-box model, reflection-interference model, diffraction-interference model and ground-interference model. Furthermore, we designed three types of dynamic network model based on the application of WSN, which are piconet, scatternet and hybrid network. Finally we showed that a whole ship can be systematically classified into 8 typical environments and suggestions for the optimization layout of intelligent ship WSN nodes were given. 中国船级社. 智能船舶规范2015[S]. 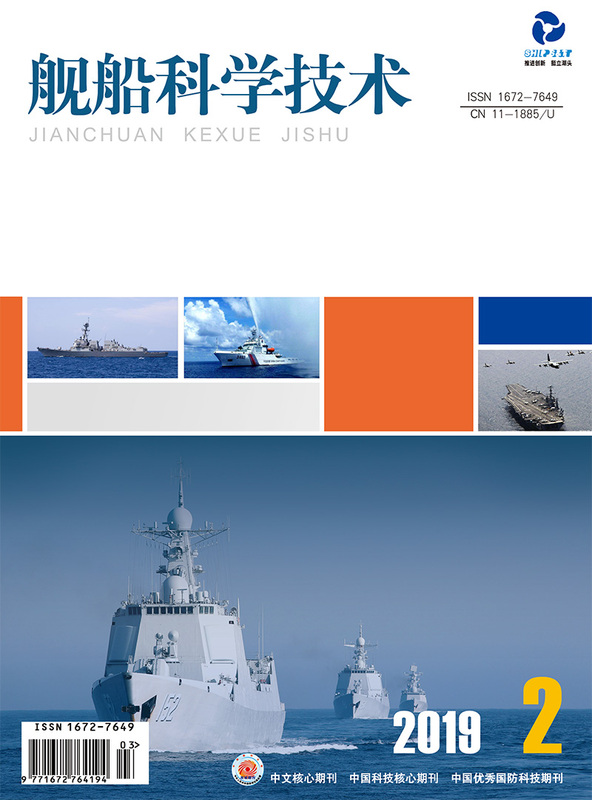 http://www.moc.gov.cn/zizhan/zhishuJG/chuanjishe/guifanzhinan/201512/P020151202371212558498.pdf China Classification Societf. Rules for Intelligent Ships (2015)[S]. 李铭志, 柳存根, 蒋如宏, 等. 船舶电气智能设计数字化信息模型研究[J]. 中国造船, 2011(1):186-192. LI Ming-zhi, LIU Cun-gen, JIANG Ru-hong, et al. Study on the digitize information model in intelligent marine electric design system[J]. Shipbuilding of China. 2011(1):186-192. 江正, 刘辉, 向先波. 基于C/S架构的船舶电站网络化无线监控系统设计[J]. 中国造船, 2015(4):179-187. JIANG Zheng, LIU Hui, XIANG Xian-bo. Wireless network monitoring system for ship power station based on C/S architecture[J]. Shipbuilding of China. 2015(4):179-187. 上海海事大学. 基于WSN构建的船舶驾驶台火灾监控系统[P]. CN 102083169 A.2011.06.01. 张晓平. WSN移动目标的LSSVR回归建模定位理论与算法[D]. 广州:华南理工大学2010. ZHANG Xiao-ping. Study on theory and algorithm of mobile target localization in WSN based on LSSVR regression modeling[D]. Guang zhou:South China University of Technology, 2010. 温家旺. 复杂条件下的无线传感器网络定位技术研究[D]. 南京:南京航空航天大学, 2014. WEN Jia-wang. Research on the localization technology in wireless sensor network under complex conditions[D]. Nan jing:Nanjing University of Aeronautics and Astronautics. 2014. 张勇, 史雅楠, 黄杰, 等. 基于独立成分分析与核典型相关分析的WLAN室内定位方法[J]. 计算机应用研究. 2016, 12, 3817-3821. ZHANG Yong, SHI Yan-an, HUANG Jie, et al, WLAN indoor positioning algorithms based on independent component analysis and kernel canonical correlation analysis[J]. Application Research of Computers. 2016, 12, 3817-3821. 覃立中. 多径反射对WSN节点测距精确度影响的分析与对策[D]. 哈尔滨:哈尔滨工业大学, 2014. QIN Li-zhong. Analysis and countermeasures about multipath reflections on the impact of WSN nodes ranging accuracy[D]. Harbin:Harbin Institute of Technology Master's Thesis, 2014. 宗立成, 叶聪, 余隋怀, 等. 载人潜水器舱室设备智能布局设计方法研究[J]. 中国造船, 2013(3):147-154. ZONG Li-cheng, YE Cong, YU Sui-huai, et al. Research and application of intelligent layout method in DSV cabin equipment[J]. Shipbuilding of China. 2013(3):147-154. 李振荣. 基于蓝牙的无线通信芯片关键技术研究[D]. 西安:西安电子科技大学2010. LI Zhen-rong. Key technology research of wireless communication chip based on bluetooth[D]. Xian:Xidian University. 2010. 汪金菊. 贝叶斯模型及其在混沌序列分析中的应用研究[D]. 合肥:合肥工业大学, 2008. WANG Jin-ju. Resear chon bayesian model swith APP lieationto chaotic time serie analysis[D]. Hefei:University of Technology, 2008. 卢中昊. 系统级电磁兼容现场测量关键技术研究[D]. 长沙:国防科学技术大学2013. LU Zhong-hao. Studies on key techniques of in-situ test for system level electromagnetic compatibility[D]. Changsha:Graduate School of National University of Defense Technology. 2013. 张志柏. 应用于复杂电磁环境下的船舶自动通信系统研究[J]. 舰船科学技术, 2016(3A):139-141. ZHANG Zhi-bai. Research on the automatic communication system of ships in the complex electromagnetic environment[J]. Ship Science and Technology, 2016(3A):139-141. 李光所. 舰船电磁环境预测分析方法[J]. 船舶电气, 2010(5):41-43. Li Guang-suo. Predictive analysison shipboard electromagnetic environment[J]. Ship & Boad. 2010(5):41-43.